Whew!! I think I speak for everyone when I say what a week, what a week, what a mighty eventful week. Thank God it’s Feel Good Friday. These five days may’ve been jam packed with depressing news (earthquakes, riots and tornados) but there was some goodness sandwiched in between. For starters, 200 Nigerian girls (not the ones Twitter made famous) kidnapped by the Boko Haram were rescued by the military. Finally, a win for the good guys. Wait, I’m not done. B-more natives refused to be labeled as “thugs” and criminals by the mainstream media for expressing outrage in the Freddie Gray murder. Yup, you read that right. Black lives do matter. Hence the prosecutor, Marilyn Mosby, ruling his death a homicide today. The Baltimore community–banned together to clean up the mess others started with riots and looting–to let the country know what the real town looks like. Hint, hint CVS burnings aren’t an everyday thing. Although it needed to be for the media to take notice. Kudos to B-more residents for changing the script on their story. 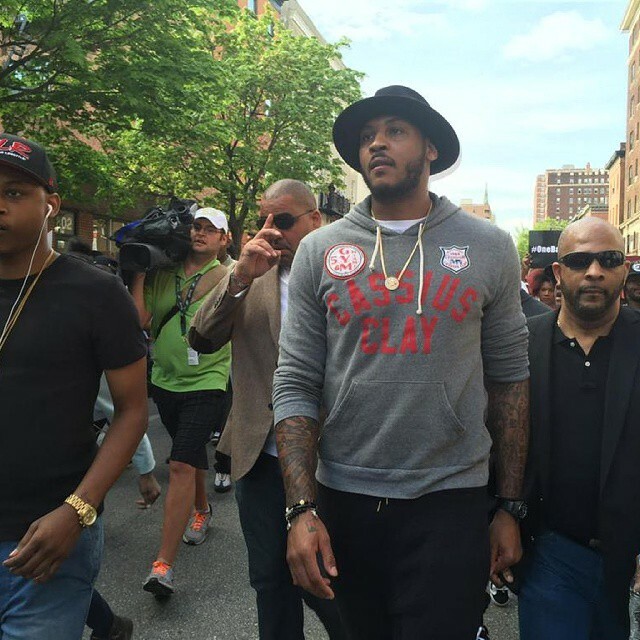 And hometown heroes like Carmelo Anthony marching in support. Finally, the silver lining in Nepal is the against-the-odds survivors of a massive earthquake. For 22 hours a baby was buried deep under rubble until being rescued. If that’s not a miracle…oh, wait two more people were pulled out. See, there is a lot to be grateful for this week. Including, Prince plans to release a song for Baltimore. No word on a release date.